The FA MIGNON SX (DOE) in depth filter cartridges are suitable for MIGNON housings, 5”M height. The Melt-blown CPP SX (DOE) in depth filter cartridges in polypropylene offer all of the benefits of high efficiency filtration. 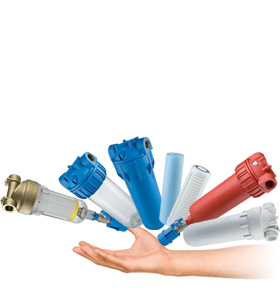 The CPP BIG SX (DOE) in depth filter cartridges in polypropylene are Melt-blown type cartridges specifically designed for DP BIG housings. The PP BX (SOE-o-ring 222) in depth filter cartridges with quick coupling and double 45 mm o-ring are made using advanced Melt-blown technology. The GA SX (DOE) in depth filter cartridges are cartridges made of a quartzite block that allows efficient removal of fine sediments, up to 10 micron. The TS MIGNON SX (DOE) washable filter cartridges are made in pleated polyester, designed for the exclusive MIGNON housings, with a height of 5”M. The CS CX (SOE- o ring-226) in depth filter cartridges in special pleated paper are supplied with quick coupling and double 57 mm o-ring. The CS MIGNON SX (DOE) in depth filter cartridges are compact dimensions filters, compatible with MIGNON housings, height 5”M. The AB SX (DOE) in depth water filters are made with a ceramic filter barrier and used to remove very fine sediments and bacteria. The AC SX (DOE) in depth filter cartridges are multi-layer pleated polypropylene borosilicate with external polypropylene cage. The AC BX (SOE-o-ring 222) in depth filter cartridges are characterised by a perfect seal thanks to the quick coupling with double 45 mm o-ring.